1. Passport: Check the validity of your passport before you make the travel plans. Certain international destinations may require passport validity of up to 6 months. 2. Visa: May be you obtained the visa for the intended destination country some months back. Ensure that your visa is valid before you buy airline tickets and it stays valid for the duration you want to travel/stay in that destination country. 3. Airline Tickets: After booking the tickets, MCIS recommends to take two printouts and store it with you at different locations. One may be in your handbag and the other may go in your check-in baggage. Also, your friends/close persons should know your travel itinerary. This way they would know where to contact/help you in case there is an emergency. It is recommended to make multiple copies (paper printout) of airline tickets and other important documents like passport, visa pages and identification cards. 4. Visitor Insurance- Do not forget to purchase visitor insurance as soon as you book the travel tickets. This would protect you financially in case of medical emergencies, trip related problems and luggage theft or loss happens. Also, it is advisable to purchase comprehensive insurance coverage instead of fixed plan coverage. This is due to the fact that Comprehensive Coverage plans offer more benefits than the fixed ones. For more details refer here. MCIS recommends that you should know where to contact your insurance company in case of any medical emergency. Keeping insurance company’s contact numbers handy is very useful in case of emergency. 5. Accommodation- Know beforehand what facilities are available in your place of stay such as hotel, resort etc. These may include Wi-Fi, fitness, restaurant & bar, etc. Also when you check-in, always make sure to pick a hotel card and keep with you at a safe place so that in case you are lost, you have the address. Also keep two copies (paper printout) of your hotel reservation with you. 6. Transport Options- On arrival know beforehand how to reach to your point of stay. You should have information about transport options to reach your hotel or place of stay. 7. Luggage-While packing your things, always make a list of valuable items you would be carrying with you during the trip. This may include valuable equipment like expensive cameras/recorders, or jewelry or important documents. Make multiple copies of this list, take one with you and keep one at home. This would also prove to be useful in case of baggage theft or loss. 8. Medical Checkup- Before taking the trip, visit your family doctor, get necessary check-ups done and also ask the physician for general recommended medicines for travel purposes. Buy these medicines locally and this would save you money and effort to find the medicine in the foreign land. Also, not all the medicines are available over the counter. 9. Vaccinations- Check with your doctor if your vaccinations are up to date. Also make sure to receive some specific vaccinations depending on the destination country. Visitors are advised to carry enough medications so as to cover them for at least a month more than their scheduled trip duration. In case their trip gets extended, they have enough to cover for them. Also, in the destination country, their medications would not be available over-the-counter and can be quite expensive too. Regarding pre-existing conditions like high blood pressure, diabetes etc., the family doctor should be consulted regarding how to take care during this trip. 10. Important Documents- All important documents like passport, national identification cards, driver license, transcripts etc. should be copied. Leave one copy at your home. If possible, make electronic copies of these documents and leave it in your email account too. 11. Weather Conditions- Make sure before departure you are well aware and prepared about the weather conditions of your departure country, destination as well as layover. This would help you in accordingly packing necessary clothing and medication (if required). As a traveler to an international destination, you should be very well prepared for any kind of emergency. It starts with knowing important things beforehand. It is always useful to know about extreme weather conditions/natural disaster warnings/political evacuation warnings en route. 12. Credit Card/Cash- If you use credit card, make sure destination country accepts that credit card. It’s recommended to use a credit card, which has no foreign transaction fee. Also carry some cash in local currency of the destination country. Airport also has facilities for currency exchange. 13. Places to eat- Search and know about good restaurants according to your preferred taste. Online ratings are useful to know if a place is good to eat. These include ratings based on hygiene, food quality, type of restaurant (fit for family etc.). Check your Baggage- Check the valuable items in your baggage once you reach your destination country. Make sure nothing is lost or stolen during the travel. Hospital Information- Know the closest hospital covered by your insurance. This would save time when emergency happens. Remember the hospital name. Local Language- Learn a few important and useful phrases in the local language. 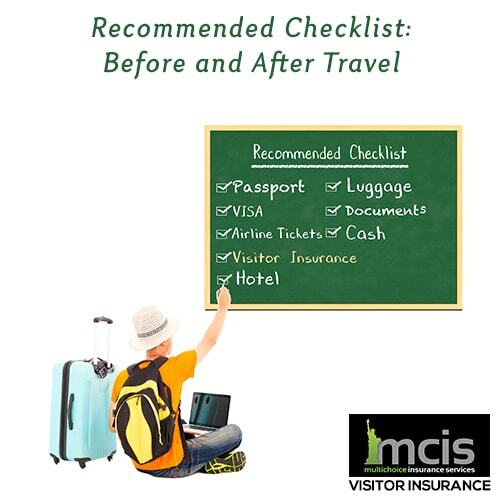 MCIS, your friendly insurance provider hopes you will find these checklists to be useful when you want a safe and hassle free trip. Contact us to know the right insurance coverage for you and your family. We can be reached at- contact@multichoiceinsurance.com. You can also call us at- +1-855-444-6247 and +1-510-353-1180.